In commemoration of the victims of genocide of Azerbaijanis on March 31 series of events was held involving the Georgian and Azerbaijani intellectuals of Georgia in Tbilisi and Marneuli with support of the Embassy of the Republic of Azerbaijan in Georgia. As embassy of Azerbaijan in Georgia told Trend, on memory evening held in Tbilisi by the Congress of Azerbaijanis in Georgia with participation of Georgian and Azerbaijani youth, was presented the historical-biographical novel, "The mountains called us", written by Major General of the Azerbaijan Army, Military Adviser of Embassy Elbrus Orujov. The book tells the story about Karabakh war, brave sons which have risen to fight for the liberation of the motherland in response to the atrocities committed by Armenian armed forces. It was noted that the book is the first real historical work written by the participant of the war. The Armenian Dashnaks who seized the power under Stepan Shaumyan's leadership in March 1918 cruelly killed tens of thousands of civilian Azerbaijanis in Baku, Shamakhi, Guba, Khachmaz, Lankaran, Hajigabul, Salyan, Zangezur, Karabakh, Nakhchivan and other areas. 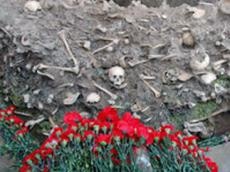 According to official sources, as a result of the genocide about 12,000 Azerbaijanis were killed, while tens of thousands went missing. "During the event it was noted that the Caucasus is synonymous with the multinational. Separatism and ethnic cleansing have made our region is vulnerable and weak. Any attempt to provoke the other peoples of our region to such steps have failed. So-called events in Sumgait and Baku in the late twentieth century were staged by the same authors, who ordered and executed policy of ethnic cleansing in the Caucasus," noted the Azerbaijani Embassy in Georgia.